Four heroes and four villains are all that remain in our March Madness. Voting is open for only a couple of days until Thursday, March 27th at http://bit.ly/1gmYEJc for your favorite characters in the current round. Once again, you as the voter have not failed to surprise us, and this round looks to be no different. Choices may be tougher, but now you only have four match-ups in this round. Surprisingly enough, all of the eight finalists have seen their characters up on the silver screen as well. Whether you know these heroes and villains best through their books or films, make certain your vote counts and either give us your ballot online or via paper at the library. 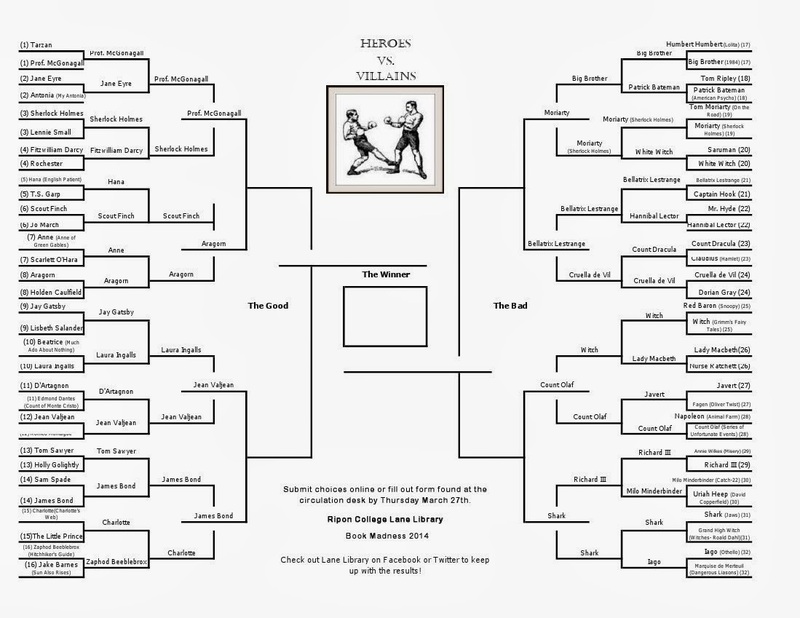 The entire bracket is below, to see the paths of each of our heroes and villains up to this point. Voting on our Elite Eight Heroes and Villains will continue through Thursday, March 27th, and our next winners will be announced on Friday, March 28th; stay tuned to our Facebook and Twitter pages for updates. Enjoy and vote to make sure your favorites make it to the Final Four!